Description: An ode to true love and the dreams of letting it thrive throughout this lifetime. It’s a box scroll card with an adorable design, which has been innovatively presented to make it more interesting. 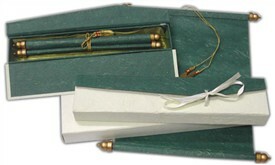 The scroll card is in red handmade silk paper, there are golden design bars framing it and is tied by a golden tassel. 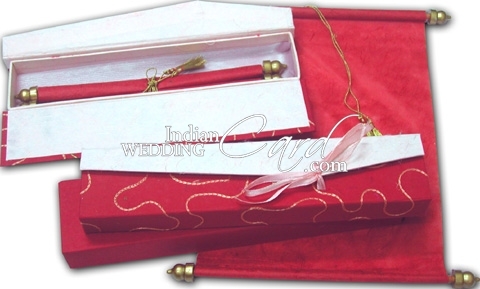 The scroll card is placed above a silvery pink satin gauze cloth and is encased in a beautifully designed red handmade paper and pink textured sheet combination box. There is elegant embroidery work in silk threads over the box, which is tied by a pink satin silk ribbon.